Home Trends Just A Minute! Changing Facebook algorithms have made getting exposure on the platform 60% harder in comparison to last year for the creators like me. But you can help me in reaching out to more people and building a strong community. Your interaction with my posts on the Facebook page can help me get noticed by the Facebook crawlers and get a good exposure. You can start by giving your 1 minute in pressing the “YES” button on “Do You Recommend This Page” dialogue box. It will take only 1 minute of your life and that 1 minute can make mine. 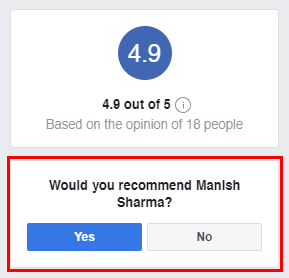 Recommendation on Facebook will not take more than a minute. This is how you can do it. 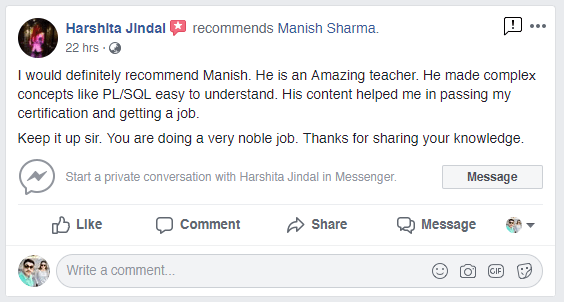 Click here to visit the recommendation section of my page. Press the “Yes” button, where it says “Do You Recommend This Page”. Love to hear 2 words from you. Additionally, I will be glad if you could write 1 or 2 sentences there. For your reference here are the screenshots of what these beautiful people have written. Or you can simply copy and paste this template. I love learning from tutorials created by Manish on RebellionRider.com. These tutorials are short, crispy and To-The-Point. And, I am proud to say that I am Team RebellionRider. Thank You for your time and Your Recommendation. P.S. If you haven’t liked my Facebook page then do so and stay connected with me. Also, please like the official Facebook page of RebellionRider.com for regular updates. Previous articleHow To Quickly Fix The Python Input Function!